By 2018, PSBs will need a whopping Rs 2.4 lakh crore (Rs 2.4 trillion) of capital to meet Basel-III norms, according to a finance ministry estimate. The government is likely to take the bank investment company route -- an omnibus holding company model proposed by the P J Nayak committee set up to review governance in banks -- to meet the capital infusion requirement in public sector banks. Finance Secretary Rajiv Mehrishi, in the US with Finance Minister Arun Jaitley to promote investment in India, told a private news channel on Monday that the government would infuse Rs 19,000 crore (Rs 190 billion) in banks this financial year, adding the amount could double next financial year. The planned capital infusion into state lenders, which account for more than 70 per cent of all outstanding bank loans, is more than double the Budget estimate for this financial year. Banks will need more funds, as they have to provide more capital for the rise in non-performing assets. According to ICRA, gross non-performing assets in the system might rise to 5.9 per cent this financial year from 4.4 per cent in 2014-15. As the government isn’t keen to allocate the funds from the Budget, a BIC could be used to meet the huge funding requirement. For a BIC to be formed, existing Acts such as the Bank Nationalisation Act, the SBI Act and the SBI (Subsidiary Banks) Act have to be repealed and all banks have to be incorporated under the Companies Act. The government will then transfer its holdings in banks to the BIC. According to the recommendations of the Nayak committee, a BIC would be constituted as a core investment company, under Reserve Bank of India registration and regulation. The nature of its business would make it akin to a passive sovereign wealth fund for government banks. Welcoming the change in approach for capital infusion, PSB executives said initially, the provisions for capital infusion might come out of annual Budgets. Later, the proposed BIC, to which government holding in PSBs would be transferred, could become the vehicle for investment. V Batra, co-head (financial sector ratings), ICRA, said the change in approach would be beneficial for the credit profiles of PSBs. While it will enhance banks' ability to lend, these lenders have to stay on course to improve asset recovery. With weak balance sheets and stocks ruling at steep discounts to book value, PSBs are heavily dependent on the government for capital. Mehrishi's statement comes ahead of eight PSBs making presentations before the Department of Financial Services on Wednesday and Thursday in Mumbai. RBI has flagged concern over inadequate capital infusion in banks. M Mundra, the central bank's deputy governor, had said the amount budgeted for investment in state-run banks wasn't enough. D R Dogra, managing director, CARE Ratings, said Mehrishi's statement was assuring for two reasons: First, it sets to rest speculation on the extent to which the government would go to recapitalise banks, given the fiscal constraints (Budget FY16 had made a provision of a little less than Rs 8,000 crore). Second, it comes at a time when PSBs are at crossroads of addressing issues of NPAs, restructured assets, Basel-III requirements and credit-growth demand. 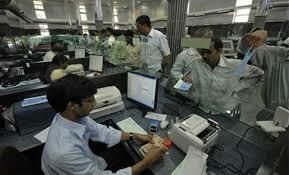 On Tuesday, the Bankex, an index tracking banking stocks on the BSE, rose 0.3 per cent to 21,091. Public sector banks: Mr Modi's nightmare?